Today brings us to Question 4 of the 30 Day Challenge and the question today is: How long have you been reading the Tarot? I could give you a simple answer, but like the Wildwood, I’m not that simplistic but nor am I that complicated. 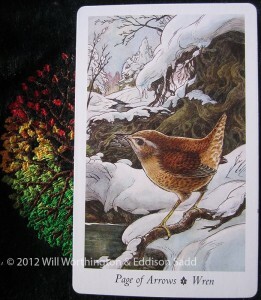 Like the Wildwood, I have a story to tell, which is what these 30 questions are designed to do: Get me to tell you, my full Tarot Story. I started reading professionally when I turned pro in 2007, when I signed up to Zen in Brindley Place. Before that though, I started reading well before, in 2005, when I signed up for the TABI Training Course. You see, after hubby sparked my interest in reading Tarot, he also suggested that I find somewhere to learn the cards, given that we had Internet Access that wasn’t dial-up. I found a site, kind of liked it, but also felt that I wasn’t quite in the right place. I was soon directed to TABI and with them, I started reading the cards, so my training began in 2005, but I probably started a little before, in the tail end of 2004. What card might represent this challenge? The challenge of learning, of finding the right tutor(s) and mentor(s)? The Page of Arrows / Swords is often attributed to learning. Note that again, this card is set in the depths of Winter? We often have time in the long winter evenings to sit and read. Obviously, they’ve never been to my house to try to undertake any of the work mothers with young children and entrepreneurs do!